"The difference between an American truck driver and a Chinese Coolie is the truck." Considering the fact that the more something is taxed the less of that something is supplied, it’s amazing a tax on production exists. Although the trade-off between work, income/payroll taxes and leisure differs according to one’s subjective values, as tax rates creep up, individuals, one by one, stop working. Some work less once additional income is taxed at 20%; for others, this figure may be as high as 80%. In the aggregate, people work fewer hours—and therefore produce less than in the absence of taxation. With less production, there is less available for consumption. Since our insatiable appetites want more goods and services to consume, an income tax is counterproductive to the creation of wealth. Yet, because high marginal tax rates cause nearly everyone to reduce production, society is denied of more of everything. *** Worse, increased productivity, which translates to more goods and services for your consuming pleasure, is made possible by greater savings, provided mostly by high-income earners. High taxes on those with high incomes only serves to bite the hand that feeds; the savings of high-income earners provide capital, the key driving force behind higher wages and living standards. Ask yourself: what’s a truck driver worth without a truck? What’s a gaffer worth without the lights? What’s a ballplayer worth without TV? What’s a server worth without a restaurant? What’s a store clerk worth without the store and computerized register and scanner? I’ll even ask it of myself: what am I worth without my computer? Let’s go back to the trucker. Without a truck, his value to others diminishes to near-zero. The Chinese Coolie, who carried a fraction of the trucker’s cargo on his back, was worth a heck of a lot less to employers and customers than a trucker with a truck. The trucker might not be as smart, as educated or as strong; yet he’s worth thousands of times more than the Coolie. Why? Because he has a truck. Now, ask a simple question: who paid for that truck—a poor guy or a rich guy? Very likely a rich guy. Who employed the trucker—and kept him employed—a poor guy or a rich guy? Even more likely a rich guy. Few remain employed by poor guys, at least for very long. And who paid for the factory that built the truck? A rich guy, maybe lots of rich guys or, in the United States, lots of median-income guys, who are rich when compared with the living standards of those in most other countries. Same with the billion dollar factories that make computer chips in enough volume to bring the price down to a few dollars per gigabyte. Poor people don’t build factories; rich guys do. The same is true for the lighting and TV/movie studios where the gaffer executes lighting plans, the TV factories and cable infrastructure that put the ballplayer (and actors and news anchors) on television, the restaurant the server works at and the factories that build the supplies he uses every workday, and the store the clerk works at and the registers and scanners he uses. And me, too. I’m worth a heck of a lot less without my computer, which has made things immeasurably more efficient (even if it allows government to complicate tax law to a degree unimaginable in the paper and pencil age). I not only hold no grudges against, but have gratitude for those with the brains and savings to create and build the components, like computer chips, that make modern society run and all of us immeasurably wealthier than our ancestors. We should make it easier for builders, savers and investors to produce—which makes all of us worth more to consumers of our goods and services. This requires that governments let them keep more of their profit—ideally, all of it. After all, in a free market without government favors, high-income producers have proven themselves capable of pleasing consumers more efficiently than others, clearly more so than governments that divert so much of what they produce. Many think wealth is a fixed sum and must be transferred from “haves” to “have nots,” which requires “win-lose” gamesmanship. Yet, using government to make people safe from want by transferring funds without the consent of those who produced the goods and services—wealth—creates no wealth and, worse, discourages the creation of new wealth. There are only three ways to increase aggregate standards of living, constituting societal wealth. None of these involve involuntary transfers, whether to the “poor” (welfare) or the “wealthy” (cronyism) or by private people (“theft”) or government (“taxation”). The most obvious is by producing goods or services that are sold to willing buyers, or donated to willing recipients. Except for voluntary donations, if others don’t willingly purchase goods and services they don’t ascribe higher values than their cost and, therefore, wealth hasn’t been created—it has been consumed. If donations are voluntarily given, to the extent the property or services were of less value to the donor and more value to the donee wealth has been created, even if there is no unit by which to measure such wealth creation. (Still, there’s nothing wrong or immoral about such charity.) Note that sales or otherwise voluntary transfers imply that such goods and services work, operate or act as advertised—i.e., fraudulent conveyances do not create wealth. A less obvious way of creating wealth is by investing in the plant, equipment, education and training that increase the quality and quantity of the production of goods and services. The third, and even less obvious way, is via protecting that which has been produced, an essential if indirect component to wealth creation. People produce more when they can keep or trade wealth they have created for other kinds of wealth. Property protection takes form in property and contract rights, along with enforcement. Most people believe that education and training creates wealth, albeit indirectly. Yet, by themselves, education and skill create little or no wealth. Of what value is a computer programmer without a computer? How much are newscasters, actors or professional athletes worth without TV and the billions in (private) infrastructure to showcase their talents? How much wealth is created by a skilled welder without welding equipment? Is any wealth created by training an astronaut when there are no space capsules and rockets? How about a geologist without a drilling rig or the millions of dollars in equipment required to dig—or a trucker without a truck? Many malign any suggestion that the wealthy create higher living standards for the rest of us as “trickle-down economics.” But take a case study in which there is little wealth to trickle down. On a recent trip to Costa Rica, our very sweet tour guide bragged about a 97.5% literacy rate. Yet, as stunning as this statistic and the scenery were, we were touring a third-world country with a yearly median household income of about $15,000 (one-third of that in the United States). They still harvest coffee by hand. In fact, they were doing many things by hand for which machinery and equipment is available. Much of the equipment in use was ancient. Why? As a country, they lack the capital to buy the tools, equipment and machinery needed for greater production. While they have plenty of educated and trained people, their lack of tools caps productivity. The former Soviet Union was and Cuba, today,***** is exemplary in this regard; Costa Rica, while lacking a totalitarian police state, isn’t hugely better off from an economic point of view. Our tour guide also bragged about their “wonderful” and “free” medical care. The problem is, like most, she didn’t understand that nothing is free. She mentioned a 50% tax on all cars, both new and used and a 9% payroll tax to fund medical care, which pays for all that “free” stuff, but didn’t put two and two together. She failed to mention the hidden and astoundingly one-sided 27% employer’s payroll tax to fund all this “free” stuff (which took some seriously deep Internet digging to uncover—suggesting no one has a clue as to its importance and that they try to hide it). Econ 101 tells us that taxes on employers result in an equal reduction in net wages. Free medical care? Not even close. The sound I hear is the sucking up of capital and crickets. I also learned that Costa Rican employers deal with a plethora of regulations in which they have few rights and employees have overwhelming power. When an employee can game the system, claim they are sick and require an employer to pay for a year of sick leave, the number of would-be and competent entrepreneurs dries up. When government edicts override private agreements, violating the rules on voluntary transfers, wealth protection is circumvented. Fewer goods and services are produced when competent would-be entrepreneurs instead choose to play and capital is scare. This is what creates third world conditions. Higher tax rates at every level discourage increased production. When an older American, with a wealth of knowledge and a lifetime of experience, is subject to federal income tax rates of 46.25% on a “chunk” of income because of the way Social Security is added to the taxable base, she is discouraged from working and producing consumable goods and services. When she realizes she is slammed with a 15.3% Self-Employment tax and a 9% state income tax on top of the 46.25% federal tax, she may walk off the job; even serfs were required to pay the king only 20% of what they produced. When it discourages such production, society suffers enormously. The flip side is also true. Young entrepreneurs are much more likely to take the risks necessary to create new industries older people never dream of. When they realize that every dollar they earn is subject to 40% tax rates on the last “chunk” of income, they are much less likely to work longer or harder. This reduces risk-taking which, until recently, created far more wealth per capita in the United States than in any other country. Remember: income earned represents the production of goods and services provided for others. Every worker reaches a point at which additional income reduced by higher tax rates is valued less than the pleasures leisure affords—and this point is reached sooner as tax rates increase. Additionally, due to high taxes the budding entrepreneur has less capital; he is less capable of buying the tools, equipment and continuing education required to increase productivity—thereby also decreasing the supply of goods and services that would otherwise be made available to others. Investors are often a different breed. Their willingness to defer personal gratification by saving instead of consuming and, frequently, to consume less than they produce over a lifetime, makes them a rich target for exorbitant taxation. However, taxes remove from their coffers the funds with which to create the tools, equipment and machinery required for the use of educated, trained or skilled worker-producers. When these funds are moved into the hands of an all-too incompetent government, it either transfers or invests them poorly (loan guarantees to Solyndra, the Alaskan “bridge to nowhere,” the California “high speed” rail, lousy “public” schools, etc.). Because government lacks a market feedback mechanism—a profit or loss—informing it’s doing a great, good, lousy or terrible job, the quality and price of goods and services cannot, in the long run, be as efficient as where such feedback exists. If instead investors were allowed to keep their funds and save and invest more, we would all be wealthier—including those of us who make their living via the use of computers and trucks. Once consumption needs are met, people save and invest. Most of the wealthy live below their means and invest the rest. Is it really them, then, that benefit from their capital? Not if by “benefitting” we mean “living high.” It’s the billions of people who benefit from the billions in private capital invested in microchip factories; it’s the billions benefiting from private capital invested in car production facilities; it’s the millions of people who benefit from private capital that paid for a theme park’s worth of multi-million dollar rides—where anyone with $105 can enjoy them for a day. All of us enjoy the fruits of others’ deferred gratification and private capital investments—from smart phones and laptops to trips to Disneyland and ocean cruises—for a tiny fraction of the cost of that capital. Billions of dollars of capital are used for the enjoyment and benefit of billions of people. Low marginal tax rates on high-income earners are desirable not because they need the money—but rather because WE need it, for capital. Only the billions invested create the plant and equipment that produce our smart phones and airliners and cruise ships, making possible our vacations to faraway places our ancestors only a century ago couldn’t even dream of. Capital, too, is the mother of wealth equality: when you consider all the “things” we have today that either didn’t exist 50 years ago or did but for which the real cost has since collapsed, capital equalizes earning power among the unskilled, weak and infirm. Nearly anyone can operate the equipment or machinery that does the vast majority of their work—“production”—and, because employers must compete for good employees, earn a decent income. A person with an IQ of 120 has no advantage over one with an IQ of 80 driving a big rig; a person weighing 240 pounds has no advantage over one weighing 120 pounds operating an excavator on a construction site; a man has no advantage over a woman on an auto assembly line. The able-bodied have little or no advantage over the disabled programming or operating a computer. By allowing additional capital to be invested rather than “spent” on taxes, flat and low tax rates would create a mother-lode of wealth. When this extra capital is available for the plant, machinery and equipment—the microprocessor factories, cell phones and trucks—we would all benefit with massively higher living standards. * A shorter version of this article was published by FEE.org on August 6, 2016: https://fee.org/articles/can-we-chill-on-denouncing-the-rich/?mc_cid=f7d24643fe&mc_eid=d986fd49f5. ** Why don’t they object? Partly because they believe government spends your money more wisely than you do (or spends other people’s money more wisely than they think other people do). Those who think this is true make excuses when it doesn’t and exclaim, “We just need a little more (of your) money and to get the right people in charge and it will all work out well!” They fail to acknowledge Austrian economist Friedrich von Hayek’s maxim: the worst tend to rise to the top in bureaucracies, because bureaucracies and incompetent employees in bureaucracies, where the bureaucrat is King, can’t fail for performing badly. In private marketplaces, where Consumer Kings rule, poor performing companies go bankrupt and incompetent individuals are quickly fired. This perverse system also survives in part due to three other factors: envy, the politics of granting deductions and tax credits to favored constituents and the politics of not only feeding bureaucracies, but also increasing overall compensation with special emphasis on public pensions that have become all but unpayable. *** That “high-enough” tax rate at which one decides they won’t work, or work less, varies tremendously from person to person, just as increasingly higher taxes on cigarettes affect smokers’ inclination to quit depend on the smoker. This is true of all prices: as prices increase, fewer consumers purchase; as prices decrease, more do so. As prices increase, more producers supply; as prices decline, fewer do so. **** A compromise: those who lack security, safety, a roof over their heads and food could be briefly helped (while the libertarian in me prefers purely voluntary charity, I’d be ok with limited government benefits for a limited period of time) and encouraged to conquer their challenges, which will help to rebuild their decimated self-esteem. ***** Which explains the ancient buildings and cars permeating Cuba. Cuba is a man-made economic calamity due to a lack of capital created by decades of socialism. You’ve prepared my parents’ taxes for decades, from the time they lived in California, through several moves, to Florida. I’m 23, just out of college and thinking about coming to California to start a business. What do you think? California suffers from the highest income tax rate in the country and mounds of regulations that cause everything from housing costs to the price of power to be among the highest. But the most destructive regulation of all is arguably an up-and-coming one, mandating annual increases to the minimum prices of wages (it’s going from $10.50 to $15 per hour in five years—a nearly 50% increase). Don’t get me wrong: I love higher real wages, created by supply and demand with people voluntarily interacting in the marketplace and fueled by increasing productivity. * However, government can’t mandate or create wealth, or the concomitant skills. If higher mandated minimums worked, why not just legislate a $100 per hour minimum wage and be done with it? Government can only destroy jobs, or incentivize the reallocation of jobs to more highly skilled people, or even robots. Many currently employed workers will become unemployable at higher mandated wages. Today, other than teenagers and other unskilled people with little job experience (especially in rural areas), very few workers actually earn the current minimum. As that minimum increases, more workers will earn it—at least the ones who manage to get and keep a job. Unfortunately, there will be fewer of them. As government demands higher minimum prices for labor, more workers will be priced out of jobs. And this will affect those currently earning higher wages: as they see lower-skilled workers earning as much as they earn now, they will demand even higher wages and increasingly price themselves out of jobs. Businesses must compete with other businesses. Some only have local competition, such as (for the most part) grocery stores and other markets. Large stores have a huge advantage over small ones by being able to move much greater volume. They can afford either to pay higher wages or purchase labor-saving machinery, such as scanners and self-check-out lanes, which will help them avoid paying those higher wages. As an upstart, you will be much less likely to be able to pay these higher wages or have the means to purchase labor-saving machines and equipment. Other businesses have national and international competition. Nationally, you will be competing with employers in other states who can pay $7.25 per hour to their workers. Not that many do so, but they clearly can pay less and hire more where the cost of living is so much lower. Internationally, you will be competing with employers in emerging economies, where capital hasn’t been around long enough to make sense of wages paid in Hong Kong, Singapore and the United States. Government-imposed mandates do not create wealth. Instead, they create a misallocation of resources. For example, a minimum mandated price of cars would eliminate the demand for many of the cheaper models, leaving only upscale cars on the market. Think of an unskilled young person as one of those cheaper models, and 40 to 60-year-olds as upscale models. Minimum prices of wages reallocate the unskilled, the newly sober, the recently-released felons and those re-entering the workforce for other reasons (such as raising children) from starter jobs, where they can acquire basic job skills, to the unemployment lines. And because less is produced, lower overall aggregate living standards are the long-term result. The higher the mandated minimum relative to median wages, the greater is the damage. Puerto Rico offers a shining example: their minimum wage is the U.S. minimum, $7.25 per hour, yet their annual per capita income of $11,000 is half that of the poorest state, Mississippi. The Puerto Rican minimum wage is 77% of median Puerto Rican wages, while the same minimum is 28% of median U.S. wages. Among those who actually produce for others via the workforce, one-third of Puerto Ricans earn the minimum wage. On the U.S. mainland only 16% do so, most of whom comprise the relatively unskilled and teens, especially in lower cost-of-living rural areas. (Well over 95% of U.S. adults in the workforce for more than a year earn more than the minimum.) Because Puerto Rican employers are not only required to pay wages way out of proportion to aggregate productivity, but also required to provide 15 days of vacation and 12 sick days annually (which amounts to an 11% increase in the minimum wage on top of administrative burdens and risk of lawsuits for labor law violations), the labor force participation rate—the percent of able-bodied adults working—is only 40-43%. By comparison, it’s about 63% (down from 69% prior to 2008) on the mainland. No wonder Puerto Ricans are relatively poor and the commonwealth is effectively bankrupt. Ok then, why do wages rise? The example of Hong Kong vs. mainland China is instructive. In 1950, they had roughly equal per capita annual incomes. Thirty five years later, Hong Kong’s per capita income was roughly 30 times that of the mainland. Yes, they benefitted from the totalitarian socialist mainland’s brain drain, but they had zero natural resources (demonstrating that natural resources are unrelated to societal wealth). The entire time, Hong Kong had no minimum wage (and didn’t until only in the last few years—silly them). Wages, then, increase for some other reason. That reason is capital, which flowed into Hong Kong, giving them the machinery and equipment that allowed for a massive increase in living standards. The problem with a $15 dollar an hour mandated minimum are many. Small employers starting out and those with little capital will not able to pay unskilled workers so high a wage; workers who would be hired at lower wages will not be hired. Small employers, who sometimes become big employers later, will not be able to start, lowering long-term employment and wealth creation. Those thinking of starting a business won’t, or they’ll move to another state (or another country) more hospitable to entrepreneurs; or, like you perhaps, won’t come here to start a business. Californians will forever forfeit your brilliance and productivity; the state government will never see your tax dollars. Consider, too, the effect on rural areas. Picture a store in an urban area, with shoppers coming and going in massive numbers; compare with a similar store in a rural area, with an occasional shopper. A store in an urban area can afford to pay much higher wages to workers because they are, by definition, much more productive than employees of a similar store where customers are few and far between. *** Robotics will do well; young, unskilled workers and newly sober addicts and newly-released felons may never get their first job. What do young men sometimes do when they don’t work? Make trouble. This does not bode well for California’s civil society. **** As much as I love California,***** if I were in your shoes I’d find a state (or country) more hospitable to and appreciative of those who, like you, are willing to forfeit current consumption for the opportunity to build a business and provide value for others. * See the article above for an understanding of how capital fuels productivity. ** Education and training could be considered part of capital, but we have shown they are at best secondary reasons why wages rise in the aggregate. Greater education and training primarily give some an advantage over others in societies with large amounts of capital; without capital, little if any advantage is provided. *** The fact there are more customers is the primary reason city wages in the aggregate are always higher than rural ones. It’s the reason people left farms for cities in early America; it’s the reason today’s Chinese peasants move to cities in increasing numbers. **** But the biggest reason to oppose mandated prices for labor is one of both property rights and contractual rights. Viewing my body as my property, I have an inalienable right to agree to work for $1 per hour, if you will have me. I don’t have to do so, but I want to know I have that choice. After all, it’s my body. ***** And I do. It’s got about the best weather on the planet, the best water skiing (the Sacramento Delta) and the best snow skiing (Mammoth). It’s like a gorgeous alcoholic: enabled because of her beauty but, without recovery, due for a premature death. A primary motivating factor for becoming self-employed is the extra freedom the self-employed are perceived to enjoy. There is no boss to answer to (except the Consumer-King!) and there is, sometimes, greater flexibility in the work schedule (and sometimes not). The fact that self-employed people often work many more hours than do most employees, including their own, may be offset by the fact that many love what they do. Since self-employed people are the ultimate decision makers for their business, they may feel more “free.” They may want to be able to blame themselves for poor decisions and take credit for good ones, with full acceptance of the monetary consequences. Like me, many don’t like bureaucracies (decades ago, I found a particular distaste for unionized workplaces with everyone earning the same wage regardless of competence, as well as for one particular company I worked for rife with backstabbing alcoholics). Another motivating factor is the prospect of having little limit to their income. Most people with the greatest earnings, with the exception of crooked politicians and bureaucrats, are or have been entrepreneurs. The problem in getting there is half of all new businesses fail in their first few years. The ones that succeed are often only marginally profitable and the few that become wildly profitable usually do so only after the owner has endured years of 18-hour days. This may be due to the competition among the self-employed, as well as between businesses in general. The desire to be self-employed is so prevalent that the supply of people who want to be self-employed may be greater than the demand for the products and services they offer. This tends to decrease the earnings of sole proprietors. I have seen many self-employed individuals take home less after business expenses, for years, than their own employees or if they went to work for someone else. Yet, they remain in business, simply to avoid being an employee. This brings up the question of how much self-employed people earn compared with their employed counterparts. To make a fair comparison, all employee benefits must be included when calculating the earnings of employees. Such benefits include retirement plans, medical and disability insurance, overtime compensation, sick pay, vacation pay and frequently other benefits that larger corporations offer employees, including employee gyms, discounts on products and free lunches and training. These benefits increase the number of proprietors who would be monetarily better off as employees. Another reason for earning less than employed counterparts is the extensive and broad knowledge self-employed people must have to ensure success. Frequently, an employee must be expert in only one specialized field. Self-employed people, however, must be at least good if not expert in many fields. They need to sell their product or service, so they have to have a good grasp of marketing and sales. They decide what must be purchased, how much and on what terms, so must be decent purchasing agents and understand the pros and cons of countless options. They must know what their products cost, directly and indirectly, including overhead and labor inputs, and know how to analyze such costs, as a cost accountant can best do. Being a good marketing strategist and cost accountant are essential to pricing one’s products or services for maximum profit in the long run. * The proprietor must often be secretary and bookkeeper and, as in my case, writer, publisher and negotiator (as when dealing with the IRS). They must be able to do all these jobs and more, until they can afford to hire such services, a time that usually doesn’t arrive until after they have had to perfect them to make their business survive. In addition, the entrepreneur must have a basic understanding of finance, administration, employee relations, banking, insurance, business law and taxation, so they’ll know when to go to a specialist for help. Another factor that may result in lower overall earnings for self-employed individuals is that businesses have ups and downs. Business owners feel recessions more quickly than employees, who are often somewhat insulated from such business conditions because corporations, especially larger ones, often don’t lay off until a moderate slowdown becomes severe. In addition to all this, successful self-employed individuals must generally be self-motivated, confident and well-organized. I don’t intend to deter others from becoming self-employed. Despite the drawbacks, I prefer seeing as many people as possible self-employed, if only for reasons having to do with paying blame or credit for poor or good decision-making and production. I hope this helps employees better appreciate and show gratitude for what employers have gone through before the employees were hired and continue to experience with employees. The employee wouldn’t have the job were it not for the employer, contrary to what many union heads and many in government would have us believe. I hope too that those who wish to become self-employed have a better understanding for what they must do to become successful. Too many would-be entrepreneurs have pie-in-the-sky dreams of glory and money, setting unrealistic goals for themselves which, in the end, thwart their success. If you go into business with full knowledge of both potentials and pitfalls, proper planning can help to prevent failure and ensure success. When I wrote this article, I never dreamed entrepreneurs might become an endangered species. Chart recreated from a Brookings Institute paper entitled, “Declining Business Dynamism in the United States: A Look at States and Metros,” by Ian Hathaway and Robert E. Litan at http://www.brookings.edu/research/papers/2014/05/declining-business-dynamism-litan. 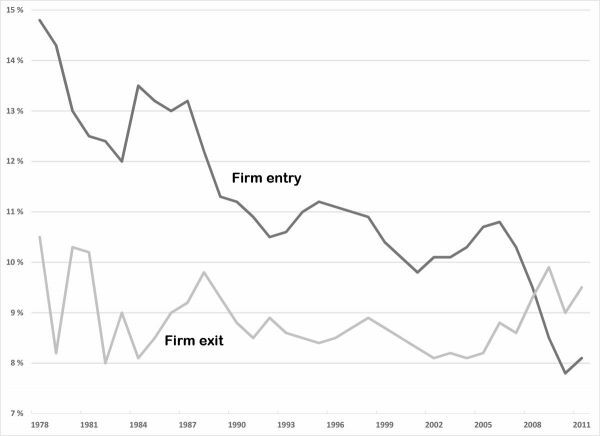 There are many reasons entrepreneurship has declined in the U.S. since the 1970s. One of these is the increase in company size, with fewer firms selling a larger variety of products and services in one location, such as the “big box” store. In one trip to a Target or Wal-Mart, you can purchase a plethora of items previously purchased at several smaller stores. Larger volumes allow them to offer lower prices; Costco, BJ’s and Sam’s Club have excelled at this, albeit with much less product choice. A small micro-processor producer will struggle to out-compete a large one because the latter can achieve lower prices on larger volume. Small firms survive in niches, but there are only so many such niches. Another reason for the reduction in entrepreneurship is increasing government intrusiveness and regulatory hurdles. Regulations are far more voluminous than three decades ago; since 1993, more than 1.5 million pages of new federal government rules, proposed rules and regulations have been published in the Federal Register (more than 200 pages per day). This doesn’t count the massive increase in state and local rules. The cost of compliance may be affordable for a large firm**; it may be cost prohibitive for a small one, especially when we run the risk of unknowingly committing felonies in the course of our work. *** The fact that many start-ups no longer start out small supports this idea. “’Anybody else?’ the agent asked as he scribbled on a notepad. Exacerbating the trend towards fewer entrepreneurs is high-handed government with a penchant for a need to control everyone and everything. The greater the number of small, independent businesses, the harder it is for government to control people and resources. Economic fascism**** requires fewer, which of necessity means larger businesses, which government finds much easier to control than countless smaller ones. The consolidation and concomitant increase in size of medical businesses and insurers is a classic case: the percentage of self-employed physicians, for example, decreased from 57% in 2000 to just 36% in 2013 and is expected to hit 33% in 2016. While I prefer more small businesses, the libertarian in me suggests that we simply leave the market alone to do what it will: serve consumers, whether customers, clients or patients, in the most cost-effective and efficient way possible. With fewer government regulations and less intrusiveness, there would likely be many more small businesses and, especially, start-ups, which would create a much more vibrant economy, thereby increasing productivity and hence living standards (aka, wages and net incomes). Our economy has been sluggish, with stagnant living standards, for years. If the United States is to remain a world leader and its citizens’ incomes are to rise, the economy needs to be freed up, not increasingly strangled by people who think they know how to live our lives and spend our earnings better than we do. * An all-too-common problem is pricing products or services too low for long-term business sustenance, as if afraid to earn a profit. Many people are emotionally at odds with maximizing profit, despite the fact that doing so in the long run is not only good for the proprietor, but also for society—they stay in business and, if the profit is perceived to be too large by would-be competitors, more competition is attracted and the supply of the product or service increases. ***Harvey Silvergate makes a good case in his book, Three Felonies a Day: How the Feds Target the Innocent, that because of the massive number of laws we live under and their pervasive vagueness, all of us have unknowingly committed felonies, even if the “three” is hyperbole. **** Economic fascism is not Nazism. Fascism is a system in which government controls the means of production without claiming outright ownership. As econlib.org puts it, it’s socialism with a capitalist veneer. By this definition, we live in a largely fascist country of which Mussolini would be proud. For a terrific discussion of fascism in all its forms, see https://fee.org/articles/economic-fascism/. ***** I ran calculations for the $1 billion loss that Presidential candidate Donald Trump suffered in 1994 and found that, assuming he used the Net Operating Loss carryover rules (as he should have) and earned $1 billion in each of the following two years, his overall tax, using today’s tax rules, would be $57 million greater than if he had earned a third of a billion in each of those three years.